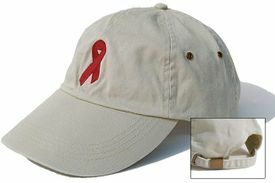 This is a beautiful Multiple Myeloma awareness embroidered khaki cap is a comfortable baseball hat style. The durable khaki cap looks lovely with the burgundy awareness logo and will keep you cool during walks and other fundraising events. It is embroidered (not patched) and has a great adjustable clip in the back. Embroidered logo is 2 1/4". Check out our full selection of Multiple Myeloma Awareness Products!